Our Family: Oh Christmas Tree! We got our little tree up tonight! For the last few years, we've been saying that we are going to get a new Christmas tree and it doesn't ever happen. We have a skinny little tree my mom gave us probably 5 years ago and it's served it's purpose, so we keep it. 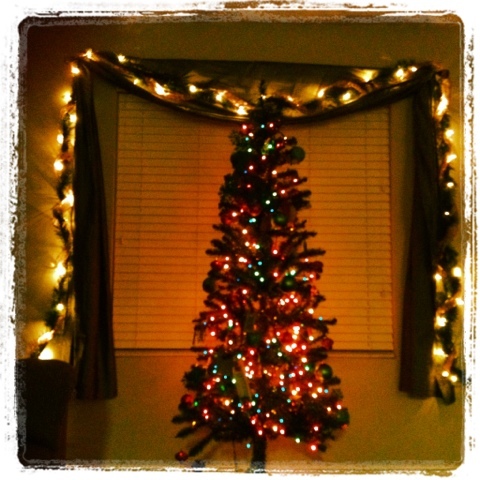 Tonight we cranked the music, and put up that little tree. Chandler exlaimed that it was the most beautiful tree that the had ever seen. I love how simple things make him so happy. The boys were so happy to decorate the tree and I foresee Rowland our elf making his appearance in the next day or two. He's an elf that plays at night and watches the boys during the day. He reports back to Santa to make sure they are being good. For now, here's our humble and most beautiful Christmas tree!